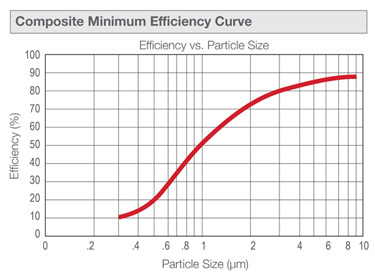 Highly efficient electrostatic filtering material attracts dust and pollen like a magnet. Captures microscopic airborne dust, pollen, mold spores, pet dander, bacteria and the particles that carry viruses. The all new PREpleat M11 HC. Designed to meet the demands of the toughest applications, the PREpleat M11 HC offers a totally unitized, die-cut box, beverage board frame with double thickness in the perimeter wall. Extremely strong and durable under normal operating conditions. The PREpleat M11 HC also has a heavy duty, expanded metal pleat support grid laminated to the media pack to increase rigidity and help maintain proper spacing between pleats. Proper pleat spacing ensures maximum efficiency, low resistance, and high dust holding capacity. The media pack is bonded to the frame at all points of contact. This bonding prevents dirty air bypass and promotes even airflow through the media pack. 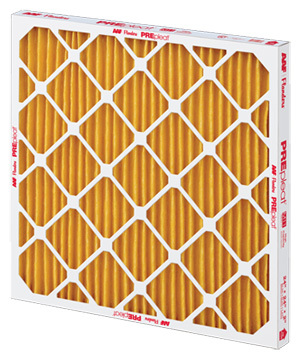 The PREpleat M11 HC construction process results in a filter which is very stable, with no racking or vibration of the pleats under normal airflow. Pleat stability minimizes the chances of captured particulate shaking loose and re-entering the airstream. To support the increased pleat depth of the 4" PREpleat M11 HC, a pleat stabilizer is added to maintain proper spacing and improve dust holding, resulting in longer service life. Media Pack Support Retainers - metal bottle cap retainer is used on custom made filters instead of a beverage board retainer. In general, all standard filter sizes are stated according to their nominal size and not their actual size. This information can be found on the side of your filter. For example, our standard PREpleat M11 HC (nominal) 20x20x1 measures (actual) 19-1/2 x 19-1/2 x 3/4. 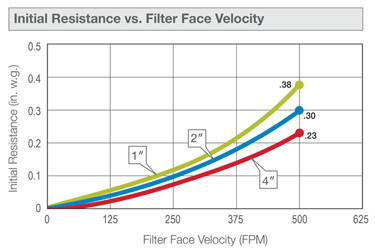 The nominal size represents the size of your filter rack. The actual size represents the size your filter needs to be to fit inside your filter rack. 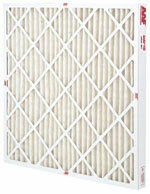 If your filter rack is an odd size, a standard sized filter may not fit properly. In this case, you would need to order a custom made filter. When ordering custom made filters please note that these filters will be made to your exact specifications © 1/8 inch. Therefore, please provide us with the exact width and length of the filter you are needing. Please be sure to measure exactly for a snug fit to allow the filter to fit within the rack but without air seepage around the filter. Remember: custom made filters are not returnable. Minimum filter size: 4" x 4" and a Maximum filter size: 25" x 35". We can build filters larger then 25" x 35" but they are considered a double size (please call us for pricing at 1-888-844-5820). If a double sized filter is required, you may consider putting two filters together to achieve the size desired, i.e. 18" x 40" you would need two 18" x 20" air filters.